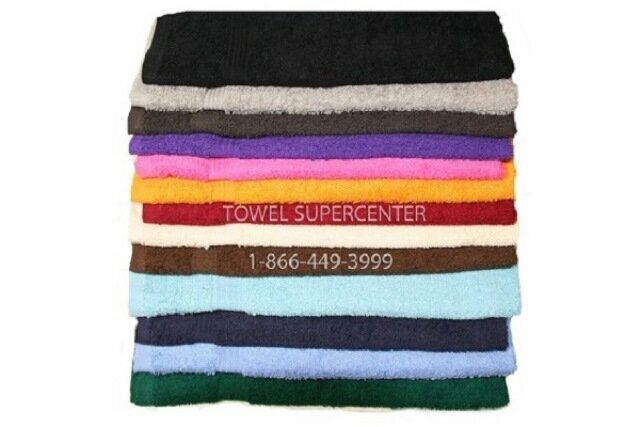 Choose from variety of colors, colored spa towels wholesale in size 16X27 for spa can be used in Hair salons, Nail salons, Gyms, Country clubs and Golf courses etc. 100% cotton towels extra soft long lasting perfect for any kind of business use. Do you want to give your hair salon or fitness spa a dash of fun and energy? Consider buying colored hand towels to spruce and spice up your everyday services. Customers will appreciate the bold beauty of our 100-percent cotton wholesale hand towels, and your employees will love how much easier work can be with the help of a cotton colored spa hand towel. After purchasing your colored spa hand towels, you'll want to keep them in tiptop shape for the long haul. You can do this with a few simple laundering procedures. First, always pre-treat any potential stains with the product of your choice. Avoid using your wholesale hand towels around bleach, dyes or chemicals that can affect the beautiful, vibrant colors. Next, launder your colored hand towels regularly. Many spas and salons routinely wash and dry their colored hand towels at least once a day. The less time they sit while damp, the better they'll look and smell after being laundered. Finally, be sure to fold or use your wholesale hand towels as soon as they come out of the dryer. They'll be fluffy and ready to impress!